The CSIRO has regions for projecting the impact of Climate Change. See https://www.climatechangeinaustralia.gov.au/en/climate-projections/futur... 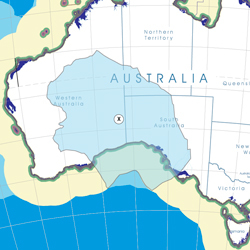 This state, Great Australian Bight (X), is included in a CSIRO cluster called "Southern & South-Western Flatlands region" (exluding the tiny bit above). CSIRO's Southern & South-Western Flatlands region coincides with BloggerMe's N,P,Q, and a tiny bit of X and a tiny bit of R.
The CSIRO has regions for projecting the impact of Climate Change. See https://www.climatechangeinaustralia.gov.au/en/climate-projections/futur... This state, Great Australian Bight (X), is one of the clear projections in a CSIRO cluster called "Rangelands region". CSIRO's Rangelands region coincides with BloggerMe's L,M,X (missing a tiny bit), R (missing a tiny bit), but includes a large bit of S (the Darling River bit). The Great Australian Bight Research Program is a partnership initiative that involves BP, CSIRO, SARDI, the University of Adelaide and Flinders University. This $20M, four-year, multi-disciplinary, multi-agency research program aims to improve our understanding of the environmental, economic and social value of the Great Australian Bight ecosystem. The program will obtain information about the unique marine environment and potential marine resources within the Ceduna sub-basin of the Great Australian Bight, and provide vital information to decision makers to support sustainable development in the region and monitor possible future impacts.